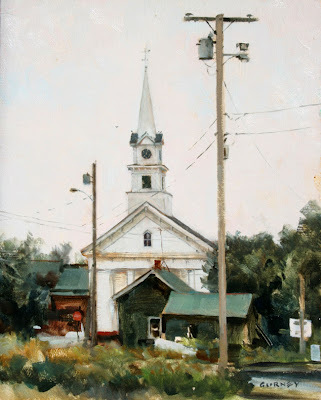 Here’s an 10 x 8 inch oil study of a church, painted from under a porch on a rainy day. What interested me was how the white color of the church resembles the tone of the sky, leaving the little dark shapes of the clock face and windows almost floating in air. 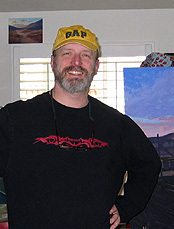 You can see the warm underpainting peeking through the semi-opaque sky colors. People often think the sky gets darker on an overcast or rainy day, but actually the opposite happens. It gets lighter in relation to anything else in the scene. Only the purest white snow can be lighter than an overcast sky. I love your urban images. Being acquainted with Dinotopia seems to give these pictures a mystical quality. Seeing your style, my eyes expect dinosaurs, sweeping cities and canyons. When they are nowhere to be found, my brain somehow still imagines them, hiding, in some abstract sense, in the periphery. Oh my gosh , you havr posted so much stuff since Ive been gone. This painting is absolutely georgous. Masterfull. Completely inspiring as always. Now I have to scroll down and read about this trip you took. All contemporary illustrators artists worth there salt are indebted to your work. You heralded the return of academic art back in the day when it wasn't fashionable. That said, I enjoy tight academic painting, but am most excited when I can see the brushwork and energy of more expressionistic personal painting. Brangwin does more for me than Pyle, (not that he wasn't great.) I encourage you to do your tight work for your commercial work and loosen up for the "fine art" like this and the tiny watercolor, let it out man. Thanks for an interesting and lovely posting. White Church stands out for many reasons - the way that underpainting has been used to give character to a rather bland sky, the way you chose to give detail to the church and hydro pole but not to the trees and foreground buildings, and finally the play in colour between the church and the sky. Your comments at the end of the posting about the sky getting lighter on an overcast or rainy day really got me thinking. At first, I thought that you were mistaken but then I tried to imagine the same scene under a cerulean blue sky. The sky would certainly have a darker tone and the building may even be lighter depending on the direction of the light source. As a budding artist, I appreciate these kind of comments as well as the photos that demonstrate how you go about creating some of your lovely paintings.